Our steel sleepers are the most advanced in the world providing lower installation and maintenance costs and more efficient logistics. Our wide range of steel sleepers is designed to cater for all types of application, from metre gauge railways to mainline passenger and heavy haul freight routes. Our steel sleepers require less ballast than traditional concrete sleepers, leading to reduced track construction and renewal costs. Also benefiting from a smaller carbon footprint, our steel sleepers are fully recyclable, making it easier to hit your sustainability targets. Investment in research and development means we can offer a wide range of broad gauge and narrow gauge steel railway sleepers. Even dual gauge sleepers are possible where projects require. These products meet modern operational demands and track-laying methods. We manufacture steel sleeper designs for applications varying from metre gauge railways through to mainline operation including heavy axle loads and high speeds. Our designs optimise the combination of sleeper and fastening - for efficient installation and minimum maintenance. Our steel railway sleepers are available in a variety of different sizes depending on traffic loading. You can view our steel sleepers datasheet for more information. The cross section profile drawing of each sleeper is given below as a pdf download. If you would like more information or have an enquiry for supply of steel sleepers then please contact us. Steel ties are lighter than concrete sleepers and have the added benefit of being stackable. Container shipping is an economical option with 300-400 standard gauge sleepers or 450-600 metric gauge sleepers being contained within one standard 20ft shipping container. 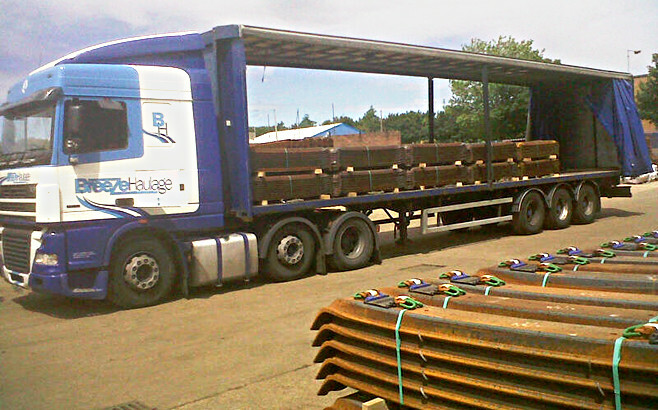 Sleepers are typically stacked in bundles of 10 which can be lifted with a standard forklift truck. Individual sleepers are light enough to be manually handled on site if required. Fewer vehicle movements on site improves safety and reduces the environmental impact of the project too. Our steel sleepers require less ballast than traditional concrete because the body of ballast within the sleeper profile provides the necessary support to distribute the load. Steel sleepers sit 'in' the ballast rather than on-top of it. This reduces both ballast depth and quality requirements delivering significant project cost savings, through reduced ballast requirements and associated logistics costs as well as obvious time savings. British Steel’s steel sleepers can be laid on existing ballast because of their unique control of the ballast bed and improved long-term drainage. Concrete sleepers require more excavation and preparation. Up to 450mm of the old ballast and formation has to be removed to achieve the greater depth needed for concrete. Once installed, steel sleepers don’t rot and are resistant to insect attack. Steel sleepers also survive well in wet tropical climates where wood decays rapidly. The sleeper profile and spade ends are designed to interact with the ballast bed to produce a highly stable track support requiring only minimal quantities of fresh imported ballast to complete the installation. With steel sleepers, you can expect lower maintenance costs over a typical lifetime of 50 years. This is because there is a reduction in wet spots using steel. Studies demonstrate benefits in longer-term track quality and stability because the contact surface of steel sleepers is higher on the ballast layer and remains drier. Where fines accumulate under concrete sleepers they become waterlogged and degradation of the ballast is accelerated. Steel sleepers have a very long life (typically 50 years) thanks to their optimised design and extensive laboratory testing of all sleeper and fastening systems. However unlike concrete and wood products at end of life steel sleepers are fully recyclable into new steel products. 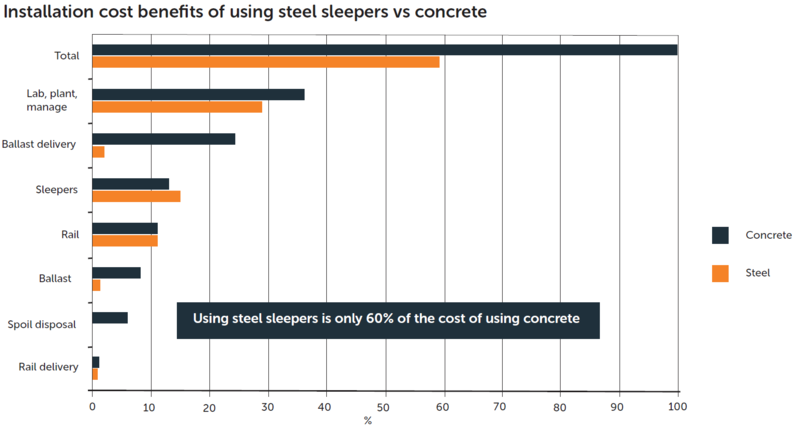 At end of life steel sleepers still contain a significant value which can be realised, rather than the disposal liabilities and costs associated with competitor products.